This article describes the behaviour of the Simple and Super Simple modes and explains how you can set up selection of these modes from your RC Transmitter. 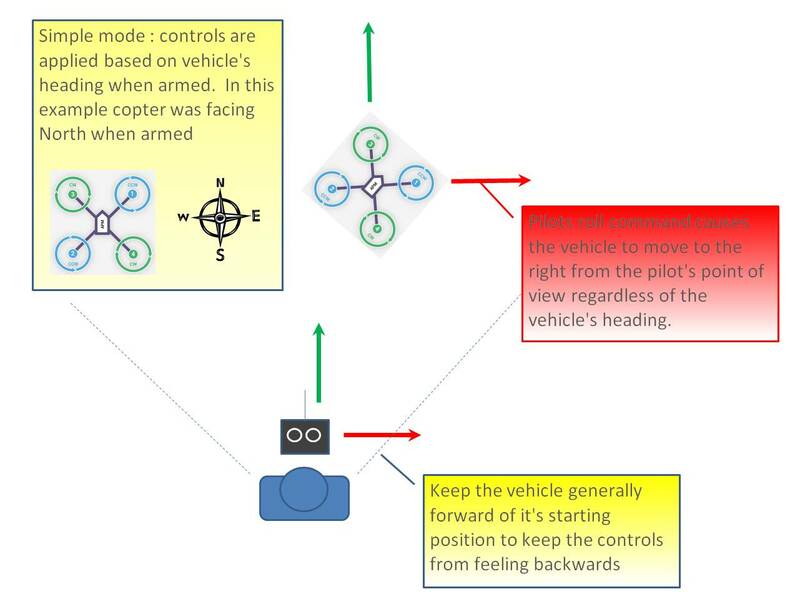 “Simple” and “Super Simple” modes allow the pilot to control the movement of the copter from the pilot’s point of view regardless of which way the copter is facing. This is useful for new pilots who have not mastered adjusting their roll and pitch inputs depending upon which way the vehicle is facing and for cases when the copter is far enough away that it’s heading is not apparent. 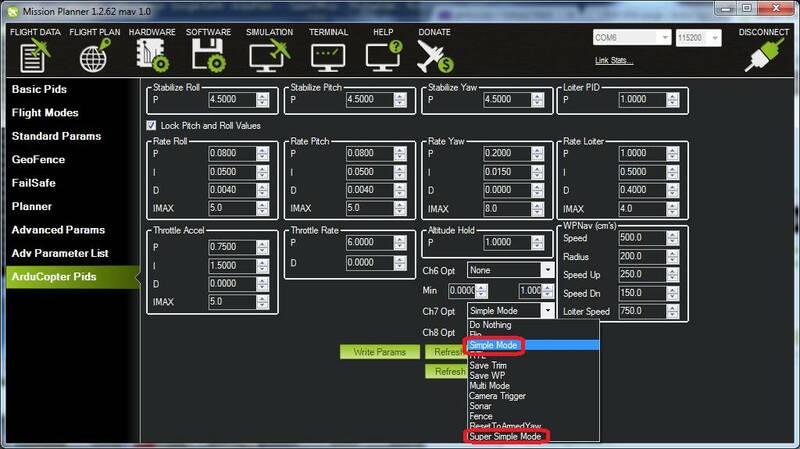 “Simple” and “Super Simple” modes can be used in combination with nearly all flight modes except the Acro and Drift (in these flight modes the setting is ignored). Simple Mode allows you to control the copter relative to the copters heading at take off and relies only on a good compass heading. Super Simple Mode allows you to control the copter relative to it’s direction from home (i.e. where it was armed) but requires a good GPS position. Either mode can be assigned to a particular flight mode switch position or can be enabled/disabled from the Ch7/Ch8 switches. Without Simple or Super Simple enabled, the pilot’s transmitter stick inputs are applied in the orientation of the copter. 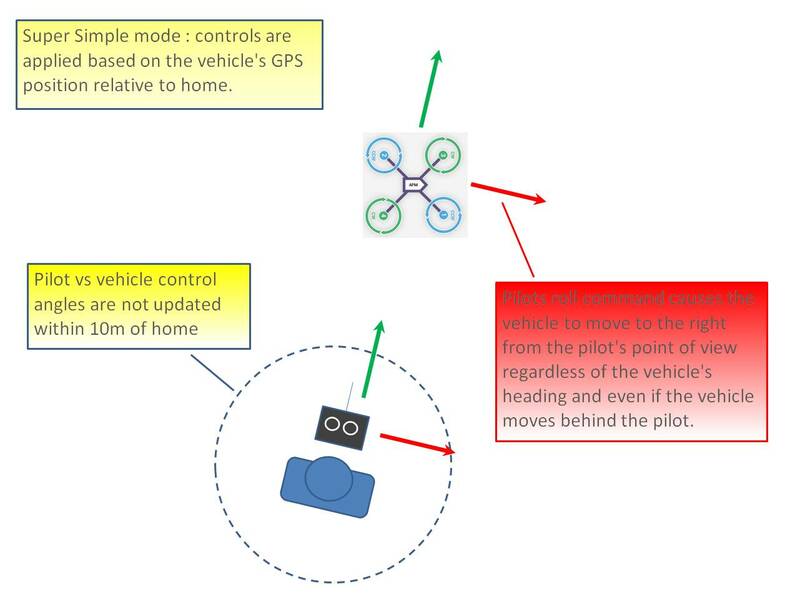 For example in the diagram above when the pilot applies roll input right (red) the vehicle rolls to it’s right. 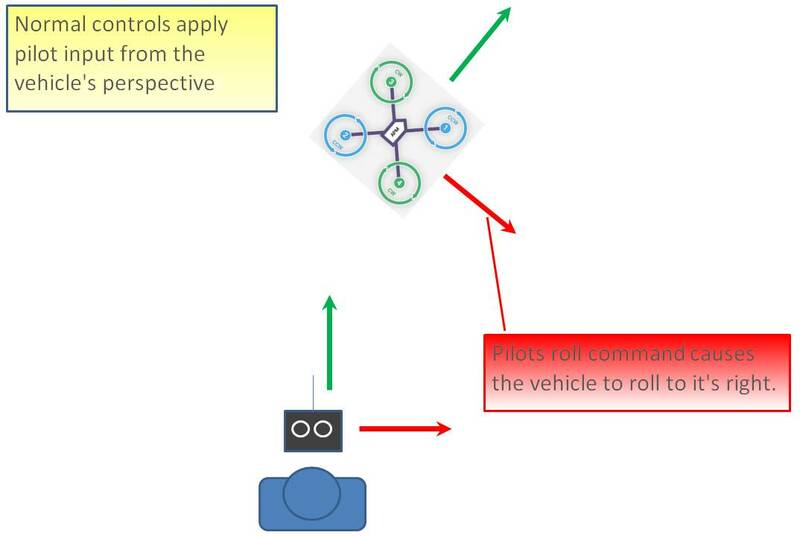 With the copter is facing in the same direction as the pilot, it is relatively easy to control the vehicle but when the vehicle is facing towards the pilot an inexperienced pilot will feel that the controls are all reversed. I.e. if the pilot inputs right roll, the vehicle will move to the left from the pilot’s point of view. Similar to the “care free” mode on other systems, this mode allows you to fly your copter as though it were pointed in the direction it was pointed when it was armed regardless of its current heading orientation. So if you hold the pitch stick forward the copter will fly away from you, pull the pitch stick back and it will come back towards home. You can even apply yaw to spin the copter in any direction but the movement of the copter’s position relative to the stick inputs will behave exactly as it did at take off. Generally when arming you should stand behind the vehicle with it’s nose pointing directly away from you. While flying you should try to keep the vehicle flying in front of it’s starting position because if it flies behind you all the controls will feel reversed. As mentioned above simple mode is also very useful in emergency situations where the copter is far enough away that it is very difficult to determine it’s heading. Super Simple mode is the same as simple mode except that it uses the vehicle’s position relative to home instead of the vehicle’s initial heading when it was armed. This means that no matter where the vehicle is, pulling the pitch back will cause it to return towards home regardless of the vehicle’s actual heading. The advantage over simple mode is that the controls are applied from the pilot’s point of view even when the copter flies behind the pilot/home location. If the pilot holds full right roll the vehicle will fly a circle clockwise around the pilot (although the circle’s radius may tend to grow slightly with each orbit due to “lag”). The disadvantage is that mode require a GPS lock because so you should ensure you have GPS lock before take-off. The orientation is not updated when the vehicle is within 10m of home meaning close fly-bys of the home location should be avoided. To ensure the controls are correct right at take-off, as with simple mode, you should arm with the pilot standing behind the vehicle and with both pilot and vehicle pointing in the same direction. The transmitter’s auxiliary channels can be set-up to enable selection of Simple mode, Super Simple mode or both. Only one auxiliary channel should be set for these modes, and this channel will override the simple/super-simple options selected on the Flight Modes screen. To support selection of just one of the modes from the transmitter, assign the mode to a channel that is mapped to a 2-position switch (high = enables the selected mode, low disables it). To enable both modes from the same switch, select Super Simple mode for a channel that is mapped to a 3-position switch (high position = Super Simple mode, middle position = Simple mode, low position = disabled).